It’s February, which means it’s impossible to avoid the Valentine’s Day buzz. Whether you’re planning a girls’ night, a date night, a mother/daughter night, or you have yet to give it a second thought, we’ve got the skinny on everything from salon hair specials to fun, flirty gifts for your hair. Look fab with a pre-date blowout or give your honey a gift-card-like hint about these deals at some of NYC’s hottest hair haunts. 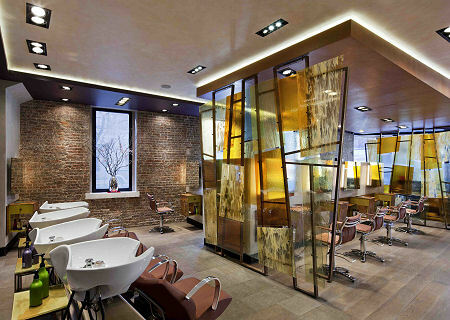 Friendly staff, warm décor and a passion for hair make this Upper West Side salon a comfy place to spend a few hours. Go with your Valentine and get 20% off both your haircuts. Even better? You’ll walk out with an aw-worthy photo to commemorate the experience. If you’re headed there alone, there’s a spa package on special that starts with a mani/pedi, includes a conditioning treatment, and ends with a blowout. Also, every $100 gift-card purchase comes with a box of chocolates which you can regift or enjoy on your way home. Visit http://www.robertstuartsalon.com. 461 Columbus Avenue. 212-496-1530. The set up adds to the already-distinct look of this 2nd floor beauty loft. Enjoy a manicure at the same time as your blowout. Bring a few friends and have some quality hang time around the communal table. Ride at nearby Soul Cycle on February 14 and get a free blowout and manicure at the beauty bar (140 E. 63rd Soul Cycle location only). Talk about the perfect pump-me-up before a night out. 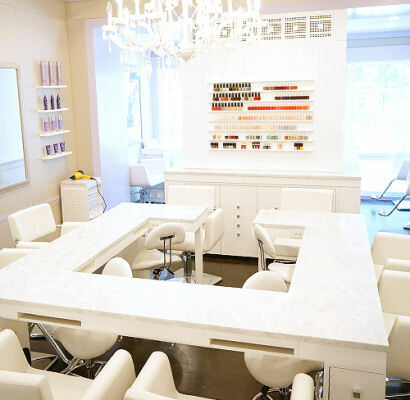 Check out http://www.fixbeautybar.com for a complete list of their blowout specials in honor of the holiday for love. Choose from girls-only or his-and-hers packages. 847 Lexington Avenue, 2nd floor. 212 744 0800. Put your feet up, relax and enjoy the special treatment at Salon Ziba. Now with a location in the West Village, you have double the space to take advantage of these deals. On Valentine’s Day, enjoy champagne and strawberries from 4 p.m. to 7 p.m. during your blowout. Bring a friend, and you’ll both enjoy a free conditioning treatment on top of it all. From 2/11 through 2/14 if your man buys a $150 gift card, he’ll get an extra $15 card free. Specials are available at both locations: 485 6th Avenue & 200 W. 57th Street. 212-767-0577. http://www.salonziba.com. If accessorizing is more your thing or you’re putting a gift bag together for your best pal, daughter or whomever, here are a few Valentine-themed ideas to get you started. 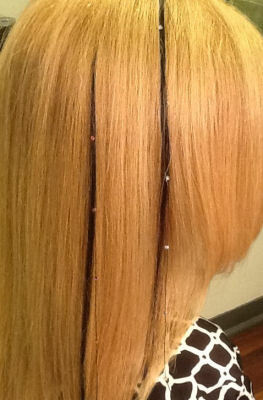 The Swarovski Crystal Extension Strands from Great Lengths can add some extra Valentine’s Day sparkle to your locks. Colors include pink, lavender, red and others. Pick your fave and visit Miano Viel Salon & Spa to have a strand or two added to your do. Call ahead to order the one you want: 212.980.3222. The young ladies in your life deserve to have a little fun this holiday, too. Give the gift of bouncing banana curls with Curl Up! Heart Sponge Hair Rollers. While the curls aren’t red-carpet worthy, they’re perfect for an all-girls sleepover party. And new from Maddyloo comes colorful hair ties in a heart-shaped box. The ties double as bracelets, so it’s like two gifts in one. Hair rollers available at Ricky’s. Maddyloo hair ties available at Lester’s or at http://www.maddyloo.com. 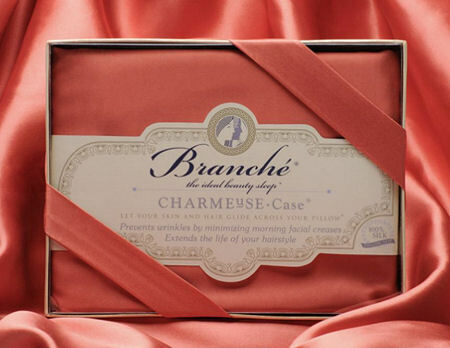 At the end of it all, sleep like a princess with the Branché Charmeuse Pillow Case. Newly released in a coral color, this case from heaven helps prolong the life of your blowout while being easy on your strands and skin at the same time. It’s made of 100% silk and really does the trick (my personal fave of all the aforementioned treats.) Available at C.O. Bigelow Apothecary. Sweet dreams. Happy Valentine’s Day ladies – do your (or your friends’) hair right!